Recently Jezeppi was asked via me of course if he would like to review some dog treats from Feedem, of course Jezeppi gave me his paw as a sign of a thumbs up whilst wagging his tail in excitement! Jezeppi has been waiting for this moment ever since we got him back in March! 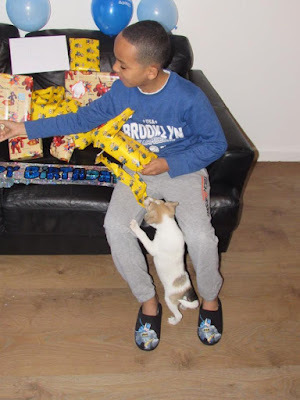 The day after we got him, it was Spud's birthday and he wanted to get in with the presents from then! Jezeppi was a birthday present for Spud! 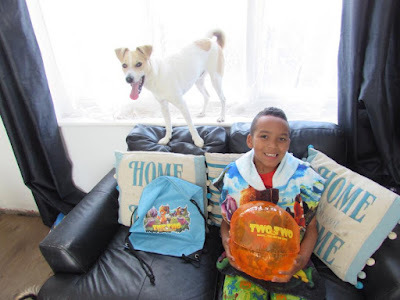 At least once a week something will arrive in the post for Spud, and every time the postman or courier knocks the door, Jezeppi gets so excited thinking the product is for him! When his box of goodies arrived for him he didn't quite know what to do with himself, I think he thought he was dreaming and it wasn't real, he quite possibly couldn't have a whole box of items just for him could he!? I was told Jezeppi could have up to £15 worth of treats from the site, which doesn't seem like a lot at all, however, this post may just surprise you at what we actually got with that £15! Every week when I go shopping I look down the pet aisle and pick up something, and I know for £15 I couldn't get much in a supermarket at all! 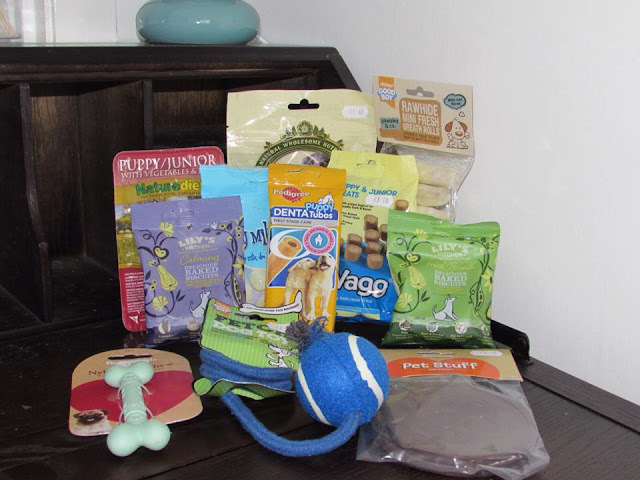 For £15, we got all of the treats pictured above and listed below, it's 11 items in total, which is brilliant! Wagg Foods Puppy & Junior Dog Treats 120gm - 85p. 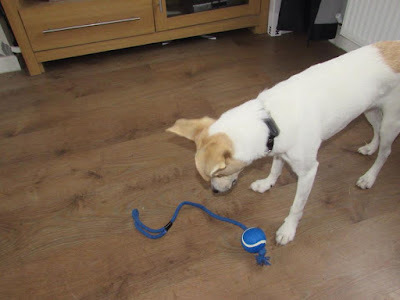 Jezeppi's favourite toy treat has to be the Armitage ball and rope toy, he plays with it every day, well thats if he can remember where he's buried it in the garden, or sometimes he hides it under the sofa, then can't get it back out! 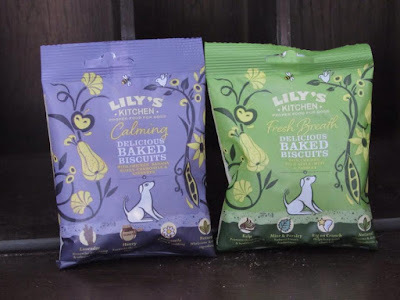 His favourite treats have to be the Lily's Kitchen delicious baked biscuits, I'm sure he would scoff down the whole bag all at once if he had the opportunity too! Now Jezeppi is getting use to Spud receiving products again! I'm very impressed with the prices of the products, with the cheapest of the products being 85p and the most expensive from our list costing £2.25, I know where I'll be shopping from in the future for any treats, toys and food I need for Jezeppi!